Now that the holidays are upon us, many of us will have little visitors in our homes that may not be around on a regular basis. Or perhaps we have kids in the house, but the holidays present a new set of challenges with all the decor and additional activities that don’t typically occur throughout the year. Keeping kids safe should be everyone's priority, but sometimes we just aren’t aware of what could potentially be in their sight and reach. So if you have children living in your home, or visiting for the holidays, here are 10 areas to keep on your radar screen. The holidays should be a time of joy and laughter, and nobody wants to spend their Christmas vacation in the ER. An ounce of prevention is worth a pound of cure! Mistletoe, holly, poinsettias, Jerusalem cherry plants are commonly used for holiday decorating and all can be considered potentially poisonous. They should be kept out of reach of small children and pets. Remember to wash your hands after handling these plants. Head injuries are just as common in the winter as they are in the summer. Accidents during winter sports such as sledding, skating, tubing and skiing can sometimes result in head trauma. Nearly 30% of all sledding related injuries are head injuries. It doesn’t take a major accident to cause severe head trauma, even small spills can result in potentially deadly head injuries. Making sure kids are ALWAYS wearing helmets when participating in outdoor winter activities can actually save their lives. Stairs and steps need to be constantly protected from children who are just learning to walk. Baby gates (like the one I built below) are the most reliable way of keeping kids off the stairs. If you have children visiting temporarily, they make non-permanent options that work as well. I have partnered with the American Cleaning Institute (ACI) to help spread the word about laundry room safety, and the holiday season is no different than the rest of the year. The best way to keep kids safe in the laundry room is keeping them out of it completely. However, every parent knows that kids are unpredictable, so it is also imperative that you keep laundry detergents and concentrated liquid laundry packets up high, secure and out of reach. Keeping detergent packs in their original packaging and not reusing the containers for their unintended purposes, reduces the chances of a laundry room accident. Here are more tips on how to create a child-safe laundry room. Many common holiday decor items can become a choking risk when they’re in reach of small children. 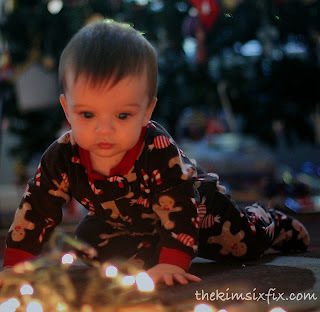 Ornaments, small toys, tinsel, beads, buttons and light bulbs should be kept out of reach at all times. Use only large non-breakable ornaments on the reachable areas of your tree and make sure all toys are age appropriate. Candles, fireplaces and stovetops are all burn hazards for both children and adults. Fires and candles should never be left unattended. The use of candle alternatives in decorating is also becoming more common. “Artificial candles” have become more and more realistic thanks to LED technology and a great alternative if it is possible that children could come into contact with them. Drowning hazards are typically associated with the summer, but beaches and swimming pools aren’t the only water hazards. Kids can drown in only a few inches of water. Thin ice, melted snow and standing water can all become dangerous to small children. Finally, just because the temperatures have dropped, it doesn’t mean pools are no longer a drowning risk. 20% of pool accidents occur during the winter months. Pool covers are not enough to keep kids safe in the winter months, you need to be just as vigilant with kids around water as you would in July or August. With all the extra lights that come out during the holidays, you need to be extra aware of possible electrocution hazards around kids and pets. Frayed cords and unprotected outlets are common areas of concern. Be careful not to overload circuits and to use appropriate indoor and outdoor rated extension cords and lights. Teach kids never to play with lightbulbs or cords and immediately discard any cords which may be damaged. Batteries, ceramics, inexpensive foil wraps and ornaments may actually contain lead or other toxic heavy metals. These toxins can be absorbed not only via ingestion , but also directly through skin contact. Using a lead check kit to check any items which may come into contact with children is a great way to ensure objects are not hazardous. The use of sharp objects such as scissors and box cutters is more common during the holidays as we spend time wrapping gifts and opening packages. Remember to put all cutting implements up and away from kids. Broken glass ornaments and figurines can also pose a laceration risk. This season, Pledge to keep your home and laundry room safe by taking ACI’s KEY Pledge! You’ll be entered to win a $2,500 gift card* for a laundry room makeover!